In order for us to maintain the standards of our profession, we are required to continue to improve our knowledge and to learn new skills to compliment our current knowledge. The importance of Continuing Professional Development (CPD) should not be underestimated. As a member of the ICNZB, achieving your CPD annually is a requirement to remain a Certified member of the Association. Degrees, diplomas or certificates achieved in previous years do not count towards your current annual allocation of CPD points. The points must be earnt in the year you are filing for. At its core it is the personal responsibility of each bookkeeper to keep your knowledge and skills current and up to date so that you can continue to be competent in your profession and deliver the service required to meet the expectations of the client. Our current CPD requirements are not onerous, are fully achievable and ensure you remain up to date in your field of expertise. The ultimate outcome of well planned CPD is that it safeguards the public, the profession and your career. CPD helps you continue to make a meaningful contribution to your team. You become more effective in your workplace and this assists you to advance in your career and move into new positions where you can lead, manage, influence, coach and mentor others. CPD helps you stay interested and interesting. Experience is a great teacher, but it does mean that we tend to do what we have always done before. Focused CPD opens you up to new possibilities, new knowledge and new areas of skills. CPD can lead to increased public confidence in individual professionals and their profession as a whole - and that’s got to be good for all of us. All members of the Association are provided with a free online CPD log which is used to record your goals and activities. The log can be found under your MyICB login. What is the point requirement for membership? In order for our profession to sustain the level of standards required, certain membership grades are required to complete keep an annual CPD register with a set point allocation. We encourage all of our members to invest in their professional development. 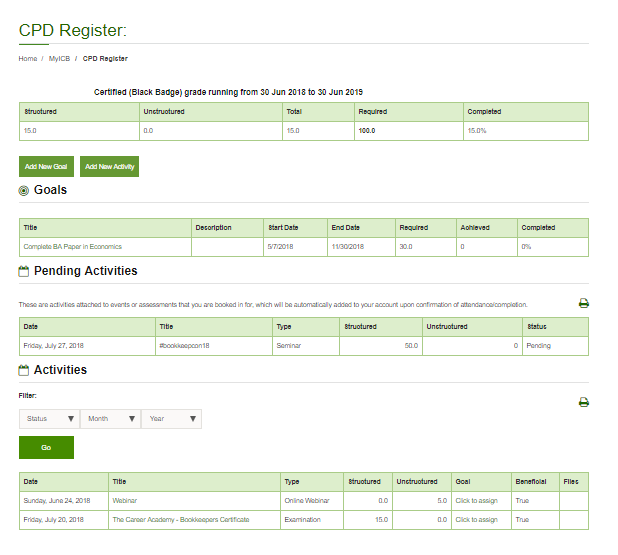 For other membership grades that have no point requirement, they are still able to access and enter their own personal CPD log. *These points have been pre-set by ICNZB as a membership requirement. What is the timeframe required for completion? The month in which you first obtain membership will be the anniversary period of your CPD log. For example if you become a member in June, your CPD register will run from June to June annually. To achieve your required points you need to complete the activity within that calendar year to maintain your membership. How are CPD points tracked? The CPD log is split into structured and unstructured activities and the point requirement can be met by a combination of both of these. There is no set amount of either type that needs to be completed. Your record of activities will be visible for the entire period of your membership and will continue to be visible under the activities window. How do I register my points? Members complete their CPD log online through their MyICB login. It is recommended that you complete your log as you go. Instructions on how to enter your activities are also found on that page. There are set activities where you will automatically achieve CPD points through the Association's Professional Development Pathway. If you have booked in through the website to attend an official ICNZB event, your points will be automatically added to your register upon confirmation of your attendance on the day. Once booked you will see the item as a pending activity in your log. Preparation of lectures, webinars or other forms of presentation. Writing books, articles or reviews for the benefit of others, whether for internal or external publications/ websites. What points are avaliable for structured activities? 15 points per supplier for a full year support. If it is software used in your business and you have a certificate, then you can claim this category. Use of learning media (online and offline) where it is undertaken on a personal basis, in isolation and without completing any form of assessment. Informal, personal research which does not result in a report to clients, colleagues or any other possible audiences. Reading textbooks, articles or other written materials that develop a practitioner's skills e.g. trade publications and industry news in any format. What points are available for unstructured activities? What happens if I haven’t achieved CPD? If you are unable to achieve your 100 CPD points within the timeframe required you wont lose membership. You will remain on notice and need to achieve CPD points the following year. Failure to achieve CPD for the second year could result in membership being downgraded to Associate Member. However as an association we want all our members to achieve CPD so if you feel you may not achieve CPD in time please contact education@icbnzai.org.nz so we can help you set some goals to achieve CPD.